Wi-Spy dual band spectrum analyzer available separately as part 120 0231. 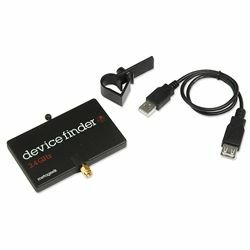 Use this portable directional antenna with the Wi-Spy dual band spectrum analyzer (sold separately) to quickly track down offending devices. It's designed to clip onto a laptop so you can sample the wireless environment right in front of you as you roam the office or campus. Just replace the dipole antenna on your spectrum analyzer with this 7dBi gain antenna with 60 degree beam width and it will help you pinpoint wireless noisemakers in no time. Requires Wi-Spy dual band spectrum analyzer, sold separately.